Faux fur is a timeless classic and never goes out of fashion! The Missguided Celine Teddy faux fur coat offers oomph of finesse to any outfit. Whether you are looking for a stylish over garment for your evening wear or a classy and comfy daytime coat, the Celine Teddy faux fur black coat is just the thing; it will add flair to any outfit looking equally as fashionable worn with jeans as it would with your best evening gown. The midi-length faux fur coat is very affordable at only £44.99, and the simple design allows it to be versatile for all ages whether you want to be emulating the very trendy and hip stars like Jennifer Lopez or the elegant and sophisticated likes of Dame Judy Dench. 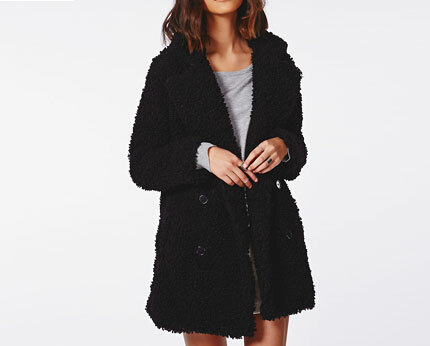 Perfect for winter months this faux fur coat allows you to be warm and cosy with a tasteful approach.